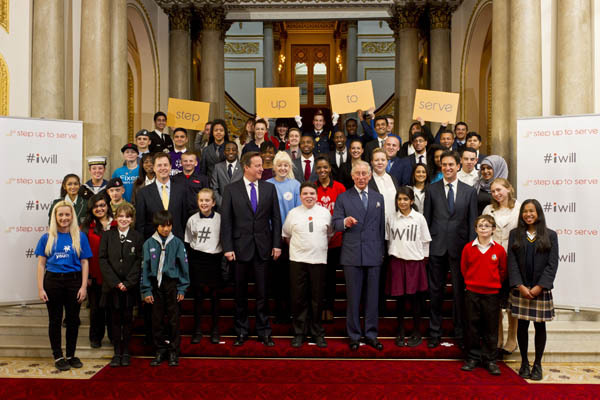 I promised I’d take 30 seconds to complete the photograph once HRH was in place (the young people were on the stairs for 20 minutes – Sorry kids!). I wrote a 30 second script that I memorised the night before to keep the shoot on track and to keep what I was saying appropriate for the diverse audience. I wanted to get a laugh from the whole group; If you think of the duration of a laugh as a bell curve I like to photograph people just after the curve’s summit, as their eyes still hold the laugh but the mouth is returning to normal. This happened on the second sentence (which wasn’t the plan!). It went: ” 1. Young people, this is your moment to swell up with pride! 2. Let that pride rise up to your cheek muscles (laugh)” …click, flash! (The BBC News 24 used this clip in their report). I like to think I bring a bit of inverse theatre to group shots ( I call it ‘inverse’ because I’m doing the performing but it is the audience that is being watched). The picture here is at the end when my digital assistant overheard Prince Charles saying to the PM something like ‘He’s good, isn’t he?’… It’s possible my reporting here is being embellished massively but I’m running with it. Technical news: The was the first outing for my Phottix Odin radio triggers (attached to two Nikon speedlights) which worked really well. That’s right, I’ve decided to make sure I’m not reliant on plugging in anything, anywhere ever again. I’m a self contained photo island! A good job too as there aren’t many plug sockets in Buckingham Palace.